Henderson is a small Midwest community located in Rush County, Indiana. The pest control professionals at Action Pest Control want to help you maintain your home and property while keeping your family and pets healthy by providing you with quality, affordable and safe pest control services. You can have the peace of mind to know that by trusting Action Pest Control you will receive timely pest control services performed by experienced, certified technicians. Whether you have ants in your kitchen, spiders in the closet, or mice in the attic, we can provide an effective solution for your Henderson property. Boxelder bugs, mice, lady bugs, flies, ants, termites and other common household pests can all invade your Henderson home, contaminate food sources, nest behind your home’s walls, spread diseases, and be very damaging and annoying! Whatever the pest, the best way to get rid of them and prevent future issues with them is to put in place a professional pest control program. At Action Pest Control, we have year-round residential pest control programs available to provide protection for your home from common household pests in addition to providing services to treat, monitor, and control termites. 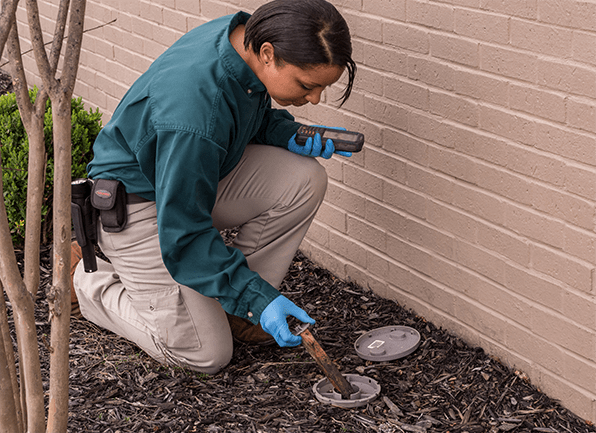 Complete pest control program- This program includes exterior pest defense and interior pest control services, termite monitoring, and termite inspection. The program also includes cobweb removal, rodent control, window sill vacuuming, and many other services. Premier pest control program- The Premier program is our most inclusive program and includes everything in the complete program in addition to our termite treatment services and our termite warranty. Both of these year-round residential pest control programs are fully guaranteed and include unlimited service calls! Get in touch with one of our professionals to find out which residential pest control program is the right fit for your Henderson, Indiana, home. Bed bugs are a tiny pest that can invade a home and cause a lot of big problems including sleepless nights. If you discover bed bugs in your Henderson home, it may be tempting to try and solve the issue on your own by placing all of the mattresses in your home on the curb. We hate to be the bearer of bad news, but this tactic will not work because despite their name, bed bugs can be found living in many areas throughout your home, not just in mattresses. The bed bug’s flat oval body fits perfectly into the cracks between floorboards, cracks in the walls, the spaces found behind outlets, and in cracks or spaces found in wood furniture. The best way to completely rid your home of bed bugs is to contact a professional bed bug control expert at the first sign of an infestation. The first step to controlling bed bugs in your home is to have a thorough bed bug inspection completed. At Action Pest Control, we use our highly trained bed bug detection dogs to accurately identify any adult bed bugs, larvae, and eggs in your home. If an infestation is discovered, we will then provide treatment through our heat remediation services. Only one day of treatment (in general). Fast re-entry into your home. Peace of mind to know that all stages - eggs, larvae, and adults- will be killed. Mosquitoes are a concern for people all over the United States. They are parasitic pests that feed on our blood, interrupt our outdoor events, leave behind itchy red welts, and transmit serious diseases. At Action Pest Control, we understand the dangers of mosquitoes, and we are dedicated to providing safe treatment to reduce populations on your Henderson property. Our mosquito control program includes an inspection by one of our professionals to find mosquito breeding areas on your property followed by treatment using EPA approved mosquito control products. These mosquito control products work to reduce the number of incoming mosquitoes that are thinking of choosing your property as their hunting grounds and prevent mosquito larvae from hatching into adults. Usually mosquitoes are a neighborhood problem; they aren’t going to just be found on your property. The best way to get the most dramatic results is to get your whole neighborhood involved. To find out more about our large-scale mosquito control program and the discounts involved, give us a call today. Termites are a pest that do not cause any harm to people, but they do cause extensive damage to the structure of homes. They enter homes silently, invade structural wood, and begin working day and night to feed their colony with the wood they excavate from your home. An initial comprehensive inspection by one of our licensed professional. Treatment with Termidor® which works to eliminate termites by both ingestion and contact. A three-month termite elimination inspection. We guarantee our termite elimination products to be 100% effective in getting rid of your home’s termite infestation in three months or less. An annual termite inspection to ensure that your home is staying termite free. A money-back guarantee as well as a damage guarantee. For more information about our termite control system including the installation of the highly effective and environmentally friendly Sentricon® Termite Colony Elimination System, contact Action Pest Control today!